With SPFx 1.7, the ability to build Microsoft Teams tabs with SharePoint Framework was released in preview. It's not just a SharePoint page hosted in a teams tab, it's aware of the context information around the current user, team, channel, tab etc. and is also able to interact with the team. The article walks us through the process of building and publishing a production package of an SPFx solution so that it can be used as a SPFx webpart as well as a tab in Microsoft Teams. In this post, we will go through the process of actually debugging the solution when it is being built. During development, when we make changes to the TypeScript code, we don't want to publish a production package to the App Catalog every time to test our changes. 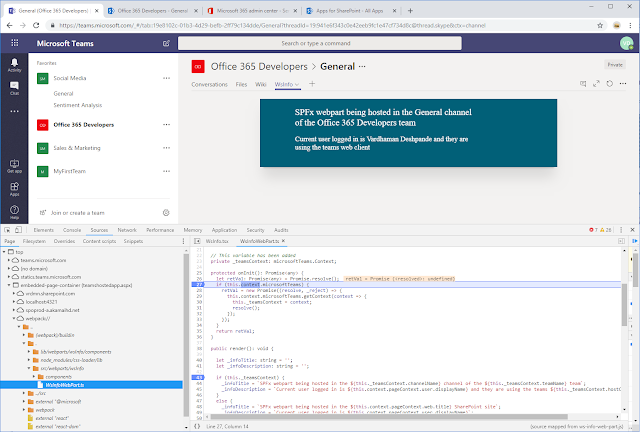 The ideal development flow for me is to upload the SPFx package once to the App Catalog on the dev tenant, run gulp serve and when changes are made to the code, they should immediately be available to test as a Microsoft Teams tab. To achieve this, first you will need to create an SPFx 1.7 solution as described in the docs, then update the webpart code to make sure that the microsoftTeams.Context is available to consume. Getting the warning which says that the scripts (Client Site Assets) will not be packaged with the solution is important as we want them to be referenced from the local dev machine. Notice that the scripts will be loaded from localhost. Now we need to upload the teams package which will make the SPFx webpart available in teams as a Tab. We make sure that side loading of apps is enabled on Teams, then go to any Team > Ellipsis > Manage Team > Apps > Upload a custom app > Upload the Zip file. Make sure gulp serve is still running and then you can test by changing something in the code and press the reload tab button. The tab should be updated with the new code. Thanks to petkir for this tip!